Credit: Defra. PC Dave Wardell, Finn, Sir Oliver Heald and Animal Welfare Minister, David Rutley. The Animal Welfare (Service Animals) Bill - commonly known as Finn’s Law – has passed its Committee Stage today (Wednesday 16th January) as it progresses through Parliament. 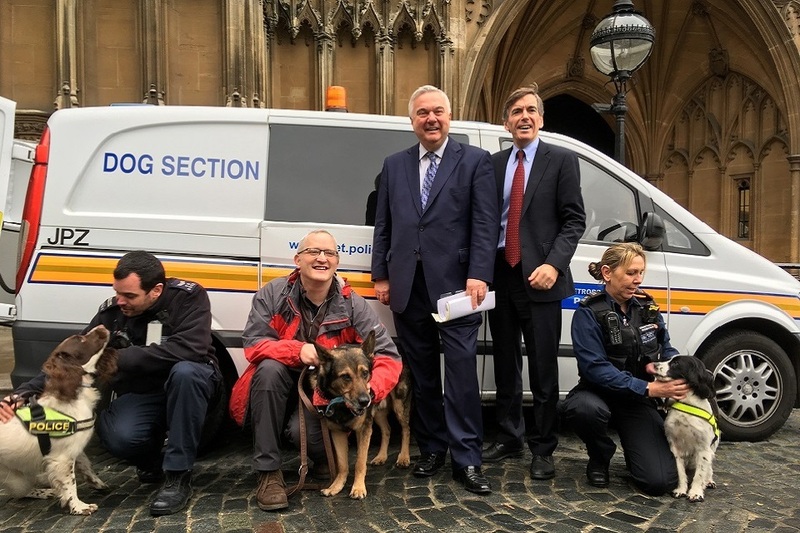 This morning, David Rutley, Minister for Animal Welfare met the heroic dog, who is the inspiration for the Bill, during Finn and PC Wardell’s visit to the Houses of Parliament. Finn’s name is rightly associated with this important Bill, so it was great to finally have the chance to meet him. The Bill will offer better protection to the service animals, like Finn, who so bravely serve us all. I applaud PC Wardell, Sir Oliver Heald and all others who have campaigned for this Bill which the Government will continue to strongly support as it progresses through Parliament. The Finn’s Law campaign takes its name from the brave police dog stabbed while pursuing a suspect with his handler PC David Wardell. The Bill will prevent those who attack or injure service animals – including police dogs and horses – from claiming self-defence. This change, couple with the Government’s plans to increase maximum sentences for animal cruelty offences to five years in prison, will make sure those who harm service animals are punished accordingly.